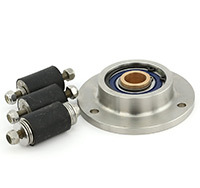 The 402809 damping bearing has been updated with this superior product. The B-9008 has a spherical (floating) bearing that offers more stability, and has a longer life. This is also a replacement for the Zodiac / Avon Z760705 damping bearing. Driveshaft Support Bearing Assy. All hardware & components required are included in this kit.